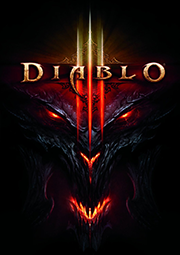 The Black Soulstone is the third of five pre-rendered cinematics in Diablo 3. At the time of its release, it contained Blizzard's best example of a believable human character. Creating appealing humans is notoriously difficult, and while Leah is by no means perfect, she was well done on the whole. There are a few shots where Leah is particularly well executed, most notably when we see a close-up of her eyes twitching before she slips into a demonic vision (at time 1:10). At BlizzCon 2011, Blizzard held a special cinematics panel that discussed the making of The Black Soulstone cinematic. In this hour long video, there is a lot of great information on every part of the process, including insights into story, concepting, lighting, material research, effects, and rigging. With painstaking effort, the artists were able to bring music, lighting, materials, modeling, and animation together to create a stunning cinematic. And its beauty did not go unnoticed in the art community. At the 10th annual VES awards, The Black Soulstone won for Outstanding Visual Effects in an Animated Commercial or Video Game Trailer (link here).